Some notable sales during the second quarter in Central London included the purchase by Brookfield of Hammerson's City office portfolio (which went for £518 million) and the purchase of Plantation Place by the Brazilian billionaire Moise Safra (at a cost of £470 million). The latter is thought to have been purchased due to the decreased value of the British pound to the Brazilian Real. In the second quarter of the year, Central London completely dominated the field in terms of investor demand - probably due to the Olympic Games being held there later in the year. Investment in commercial property in Central London defied expectations during the third quarter of the year, when - rather than remaining static or decreasing, as was thought would occur with the distraction of the Olympic Games - deal sizes increased from a £15.5 million average to £22.5 million. However, the number of deals completed did decrease by 28%, perhaps averaging the increase previously mentioned. The third quarter of the year showed a decrease in the demand for offices by 7%, therefore still averaging at an increase of 1% from the previous year, while license lengths for newly defined serviced office tenants (SOTs) also decreased to 7.8 months compared to 8.3 months previously. However, it is office properties which still dominate the commercial property investment field in Central London, though a characterising increase in shopping centre deals seen during the third quarter. During this third quarter, a difference in investors was clearly seen. 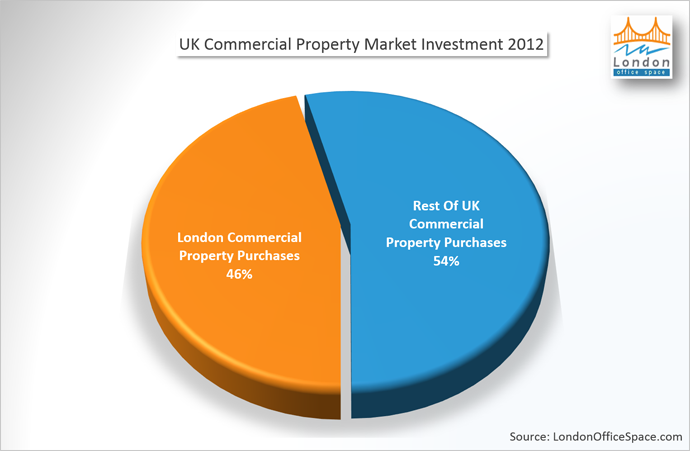 Rather than, as in the first and second quarters, the majority of investors being from offshore, it was the UK which were seen to be the biggest buyers in commercial property in Central London. The last quarter has showed a slow-down in rental growth across the globe, though it remains steadily increasing. Though this quarter is usually one of the most active, the Eurozone debt crisis has been felt across the board, with investment in Central London falling by 16%. However, London is still shown the most popular place in the UK for investing in commercial property, with 46% of overall purchases occurring there this quarter. The decrease in investment numbers, combined with an outwards yield shift of 27 basis points, shows that Central London office prices have reached their zenith and are thought to plateau now. The major shift in investments has been in the medium sized deals, which decreased from 125 during the third quarter to only 85 this quarter. As medium deals are generally associated with home investments, it can be concluded that UK institutions have decreased their investment by roughly 50%. However, there was an increase during the fourth quarter in investment by foreign bodies, with figures reaching £3.57 billion compared to £2.28 billion in the third quarter.